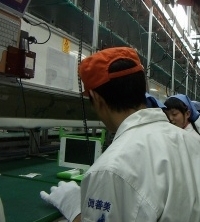 OLPC XO production in September? Woohoo! Could this be true? Could I be reading this China Post news story right? Did Michail Bletsas, Chief Connectivity Officer of One Laptop Per Child just confirm that Nicholas Negroponte has finally succeeded in reaching his OLPC XO production "trigger" - confirmed orders for 3 million Children's Machines?! Quanta will increase production to 400,000 units a month by the end of the year, Bletsas said on the sidelines of an industry conference. Each laptop costs US$175 to make, with expenses to fall to US$100 by the end of 2008, he said. Three million will be made in the first round of production, Bletsas said. After all the hard work on clock-stopping hot technology, hand-wringing about operating systems, and the nail-biting suspense around participating countries, might congratulations be in order for the entire OLPC Leadership for all their hard work and dedication to reach this great milestone for the One Laptop Per Child program and one-to-one computing in education? Tim Li, Quanta's spokesman, couldn't be reached at his office and mobile phones for comment. Now we can only wait to see what Nicholas Negroponte, OLPC's great spokesman, might say. As some of you know, B3 is about to be built (in the next 24 hours, in fact): but it is a small build, and not targeted at field deployment. The next major build of machines is B4, many of which will be deployed into the field. Here are some dates for planning (subject to change). 6/08-6/15* Integration and test of system image. The starred dates are the software dates; I add the hardware dates to put them in context. "Michail Bletsas, chief connectivity officer for the organization, says OLPC has more than reached its goal of 5 million orders for delivery in the first year—that is, by early 2008." Thanks Troy, that confirms Mr. Bletsas's unreliability. Just a few weeks ago, long after the IEEE article, even Negroponte himself said that OLPC only had 2.5 million in order interest, none confirmed. "Jepsen said monthly shipments of XO will only be 10,000-20,000 units initially but will reach 10 million units in two to three years." Impressive scheduling for that B4 widget. Two weeks to freeze the software, including one week to test - all done a few weeks from now. Whatever happened to "finishing" sugar and bifrost and etc.? Personally I'll only believe this when both Quanta and Negroponte make definite statements on this topic! Calling somebody "unreliable" based on third-party hearsay taken out of context, doesn't help anyone's cause and speaks more to your reliability than mine. I answered a very specific question to the Bloomberg reporter in Taipei on Monday: "When will production start and how many units will Quanta be making?". The quote attributed to me is accurate, everything else is inference. And for the record, I have never said that our battery will have 20000 cycles. The number that I used was "a maximum of 2000 cycles". As far as the BBC interview is concerned, what I told the reporter was that we (OLPC) were contemplating twinning options (buy 1 and pay for another 1,2 etc.) but we were *not* going to have a definite plan until 2008. I would like to remind you that after we complained to BBC, the article was retracted! Michail, very good of you to come forward and state your case. I think, given the high profile nature of OLPC, many 'quotes' taken during interviews do get spread around and taken out of context. The issue is really to have statements made by relevant OLPC spokespeople be consistant. If you provide a figure to an interviewer and someone else in OLPC provide a different figure then who is right? If Mr Negroponte says he has firm orders for 3 million laptops and somone else says they are waiting for orders then who is right? Of course situations change over time and what one person says three months ago may not be relevant now. For us, frames of reference go out the window and we can only look back to what has been quoted previously. I think three 'blunders' is quite acceptable. For everyone else its three too many.